To think that gangs are an aberration, or impermanent structure, is a mistake: they are stable social structures, governed by the same bonding mechanisms as the local church, or regional police force. They are structures of power, partly formalised, partly social, partly visible, largely hidden, but deeply interconnected, often organised, and intractably opposed. 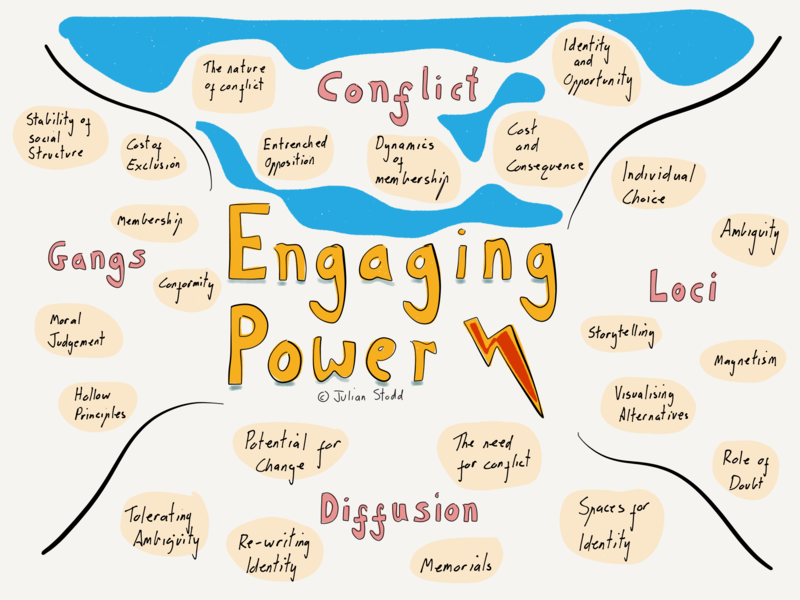 As part of a wider body of work, exploring ‘types of power’, and understanding the radically complex social structures of Organisations, i’m writing about ‘engaging power’. In a series of four posts, i want to consider entrenched gang violence as a case study of engaged (and engaging) power. To look beyond a simple narrative, of dysfunction, criminality, and failure, to consider why gangs persist: if they were purely destructive, nihilistic, or straight evil, surely they would have fragmented through their own inability to function. And yet they do not: they persist, and in cities like London today, spread, carrying gang violence with them. 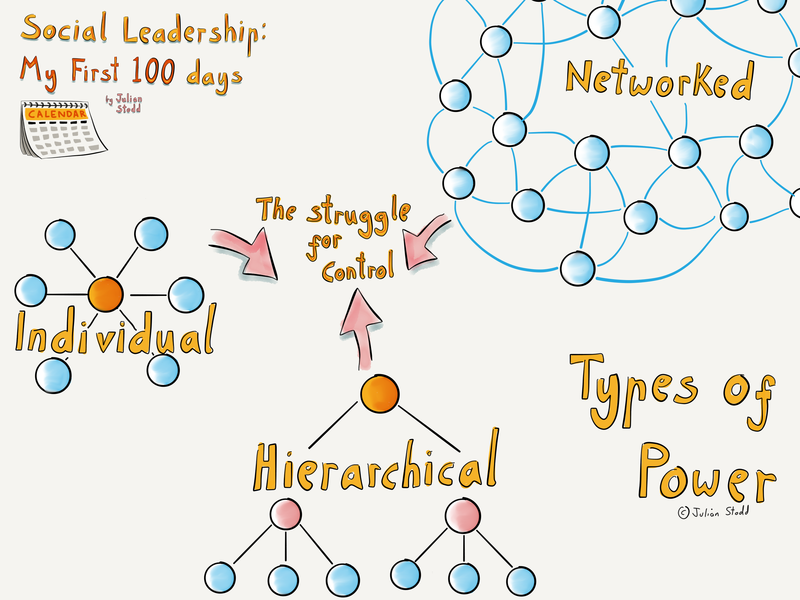 What causes these social structures to form and persist? Are they simply a mirror image of the social structures of knitting circles, and gardening clubs, or is there something innately different? And perhaps more importantly, where we do see criminality, violence, social destruction, and deprivation, what can we do about it? We will start by considering the nature of conflict, entrenched opposition, dynamics of membership, and the cost and consequence of such, as well as understanding how gangs relate to identity and opportunity, and may as much reflect a problem as they do cause it. In subsequence pieces we will look at the stability of these social structures, the cost of exclusion, the moral judgement of wider society, and the hollow principles that perpetuate conflict . We will consider how the binary positions taken by formal systems can embed conflict, and how space for ambiguity can allow us to visualise alternatives, as well as the role of doubt in driving individual choice . Finally, we will look at how we open up to the potential for change, learn to tolerate ambiguity, and move from conflict, to transience . These four pieces are part of a reflection, so whilst i have laid out low structure, i’m going to allow it to drift if needed. When i read a news report about a young person stabbed on the streets of the capital, i cannot conceive of what would drive someone to do it. Nothing in my experience of growing up, of being part of society, has primed or prepared me to carry out such an act myself. And that is largely the point. These are not the acts of my society: they are acts in an equally real, and entirely invisible, parallel society. These are often acts carried out by individuals whose experience of education, the law, and civil society are entirely different from my own. I am separated by class (in a supposedly classless society), wealth (in a society where we suppose to value life, not just wealth), and structural inequality (where money can bypass queues, prolong life, and almost entirely gate you off from segments of the community you live alongside. We exist in a society with an unequal distribution of violence, and, to large extent that’s why we permit it to perpetuate. We do not face an equal opportunity for conflict: whilst any of us may be the victim of crime, there is no doubt that where you grow up, and how you grow up, will impact your chances. We are each subject to different forces of conflict and, crucially, different formative forces of how normal conflict is. For me, it’s unusual, for others, not so much. Unequal distribution of conflict, especially when layered upon structural inequality (often on ethnic lines, or the colour of your skin), lead to an uneasy situation where it may play into the hands of political power to entrench the conflict. I say this with some care, but everyone likes an enemy, and if that enemy is visible, partitioned, and (most importantly) does not really present an existential threat, so much the better. Much of our overt economy, and society, is a convenient fiction, layered on top of the grey economy, true modes of social organisation and power, held in reputation, consequence, generosity, kindness, empathy, trust, and fear. For as many formal structures we have (governments, police, schools, supermarkets), we have social ones (families, friendship groups, clubs, gangs). Much of the true value in society, certainly much of our experience of it, is held in these secondary structures. We may live within the formal walls of our houses, within the concrete boundaries of our towns, but we experience life in the relationships that we hold, the values we demonstrate, and the lived experience of the touch of others. Part of my own evolving understanding of ‘types of power’, driven by our evolving political landscape, is that many communities are held together almost entirely in opposition: they are not united through conformity in views, but rather in opposition to someone, or something, else. In other words, we may be united in our condemnation of gang related violence, without any underlying understanding, appreciation, or experience, of what it actually is, why it’s caused, or how to actually resolve it. We are united in our opposition, because to be in opposition is both socially validating, and low risk. Which leads us partly to the reason why we are entrenched in this type of urban conflict: the oppositional power, which leads us to sanction ever stronger policing, and the vilification of gang members (see press images of young black men, or tattooed, shirtless, hard staring latinos) objectifies them, validates our bias, and makes us ever more certain that they are beyond redemption and, crucially, are something to be feared. Even if we have no lived experience of them. In this state, the opportunity for empathy, trust, or indeed true change, is limited. But more than that, the very social structures that unite us in opposition hold us tightly in conformity ourselves: it becomes socially risky to express a dissenting view. Oppositional systems are weirdly more stable than coalition or consensus ones in some ways. It suits us to be opposed to gangs, because being opposed to gangs in itself confers membership of the ‘good’ part of society, notwithstanding that we are all (gangs, police, victims, and perpetrators, onlookers and all) part of one society. Albeit a fragmented one. People join gangs not specifically because they are ‘bad’, but because the balance of cost mitigates that they do so. Much the same as the decision to join a gym, a church, or a book club. The decision may be ideological (belief, or dogma), aspirational (desire, greed), desperate (hope, salvation), fearful (consequence, cost), conformist (you joined first), accidental (geography, coincidence), or incidental (cost today vs larger reward tomorrow). And once you are ‘in’, it’s harder to be ‘out’. There are many forces that hold social systems in place: some are aggregating, magnetic, positive, others divisive, oppositional, identity based. Both are equally valid, and any conversation about conflict must recognise that both are equally strong. Tomorrow, i’ll consider the roots of conflict, the stability of gang structures, the cost of membership, and the role of moral judgement. This entry was posted in Community and tagged Behaviour, Community, Conflict, Gangs, Government, Justice, Membership, Police, Policing, Power, Violence. Bookmark the permalink.